One of the most controversial but well-intentioned products in the health care insurance industry is long-term care insurance. Designed to cover the prohibitively high cost of long-term care for in-home assistance, assisted living or nursing homes, long-term care insurance is itself prohibitively costly. It has to be expensive because insurance companies sell policies which, when implemented to cover health-care costs, can end up costing the insurance company millions of dollars. Consumers who purchase long-term care insurance pay a great amount upfront in order to avoid paying much more should the insured person require years of expensive long-term care. The balance for insurance companies is that many people who purchase long-term care insurance never use it due to an untimely or sudden death of the insured. The industry continues to try to balance the cost of long-term care insurance with the cost of paying out long-term care insurance policies in order to make the product more attractive to consumers. But the product is still not a popular choice among affluent investors, many whom feel they can cover the costs of long-term care with other savings or income streams. According to Spectrem’s study Investor Attitudes and Ownership of insurance Products, only 19 percent of investors with a net worth between $100,000 and $25 million own long-term care insurance. However, the only other forms of insurance that appear to be more popular are whole life (29 percent) and term life (28 percent), which each appeal to a different subset of investors mostly depending on age. Among the investors who own long-term care insurance, more than half (52 percent) made the purchase because they do not want to present a financial burden to their children. Future guilt is a powerful motivator. However, 35 percent of long-term care insurance owners also say they made the purchase based on a recommendation from someone other than a friend or family member. That means someone involved with the finances of the insured made the recommendation, and that likely was either a financial advisor, accountant or an insurance agent. Twenty-three percent of long-term care insurance owners heard tales from friends who either purchased such insurance and are glad they did or did not purchase long-term care insurance and wish they had done so. Obviously, with only 19 percent of investors owning long-term care insurance, 81 percent of investors do not, and among those, almost 40 percent say they considered purchasing long-term care insurance but determined it was too expensive. The cost of long-term care insurance rises as the insured ages, but the counterbalance to that is older investors tend to be wealthier, making the expense easier to handle financially. Thirty-two percent of investors who do not have long-term care insurance say they can self-fund their long-term health care expenses. There is also a segment of the investor population that has too many questions about the value and eventual payout provisions of long-term care insurance. Thirteen percent of investors without such insurance say they don’t trust the concept, and another 13 percent consider the purchase of long-term care insurance as just “throwing my money away”. 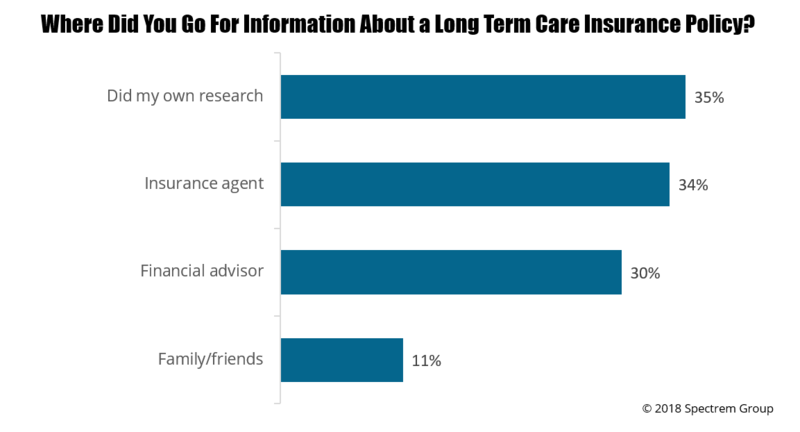 The investors in this study were asked to name their top information sources regarding long-term care insurance, and one-third said they spoke to their financial advisor. That included 58 percent of those investors from the Gen X and Millennial generations, meaning there is an uptick in conversations between advisors and investors about long-term care insurance. Advisors can properly inform investors whether they have the assets elsewhere to cover their possible medical and long-term care needs or whether they should give long-term care insurance serious contemplation.